1 medium apple, cored and grated. 1 cup of rolled oats. 1 cup of wholewheat flour. 1 ½ teaspoons of baking powder. 1 ½ teaspoons of cinnamon. Spray a muffin pan with non-stick cooking spray. In a large mixing bowl, stir together the buttermilk, the oats, and the raisins. In a separate bowl, blend the wholewheat flour, baking powder, cinnamon and salt. Add the egg whites and honey to the oat mix, and blend thoroughly. Blend the two mixtures together. Fold in the grated apple. 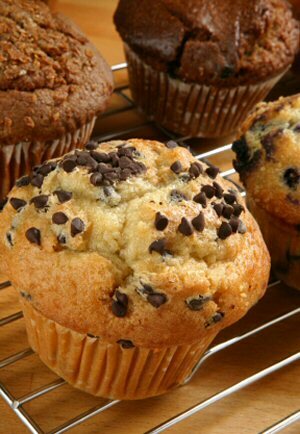 Fill the muffin cups to almost full. Bake 350°F (175°C) for about 20-25 minutes. Cool the muffins in a pan for about 10 minutes for to allow for easier removing.